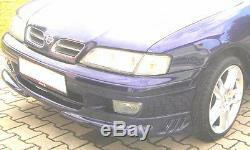 Frontspoiler Nissan Primera P11 1996-99. GFK / Fiberglass einfache Montage / easy fitting, Teil ist nicht lackiert / part is not painted. Mit TÜV-Teilegutachten §19.3 / with TÜV certification. Es handelt sich um Neuware, jedoch keine Original- oder Originalteile. The item "Frontspoiler Nissan Primera P11 (PP 25245)" is in sale since Tuesday, February 6, 2018. This item is in the category "Auto & Motorrad\ Teile\Auto-Tuning & -Styling\Karosserie & Exterieur Styling\Stoßstangen". The seller is "ledltuning" and is located in Tattendorf.